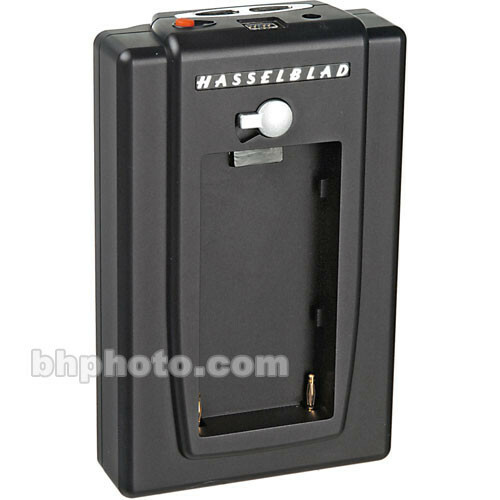 The Hasselblad Image Bank II is an accessory storage drive for newer Hasselblad digital backs with a CF/CFH/HXD interface. It is based on a 100GB hard drive powered by a Sony L type battery. It has a FireWire 800 interface for rapid transfers to a computer, and the drive has no burst depth to slow down shooting. The image bank is able to save images without any buffer stall until its maximum capacity is reached. Box Dimensions (LxWxH) 13.1 x 9.5 x 5.1"
100GB Image Bank II for Digital Backs w/ H2D/H3D/CF/CFV/503CWD is rated 5.0 out of 5 by 2. Rated 5 out of 5 by Udo from double usage The primary reason to purchase this ImageBank was to power my H-back used on a view camera. It is much smaller and lighter than expected. The rechargeable batteries being used are common types for Sony video equipment. There are different sizes available which expand the usage time in the field. It can of course be used for storage which makes it a handy unit. Data transfer to a computer is fast thanks to firewire interface. Since I am using this item since a couple of weeks by now I cannot comment on long term reliability. It is well and precisely made and simple to use. Rated 5 out of 5 by Anonymous from Must Have H3D Owners Works fantastic. They should be included with each camera. Well worth price.